The French statesman Edouard Daladier represented his country at the Munich Conference in September 1938. The son of a baker, Edouard Daladier was born on June 18, 1884, at Carpentras. An ardent Dreyfusard schoolteacher and member of the Radical Socialist party, he was elected to Parliament in 1919. He attained ministerial rank under his former teacher edouard Herriot in 1924 and served in most cabinets until 1940. During his first premiership, from January to October 1933, Daladier signed the Four-Power Peace Pact with Great Britain, Germany, and Italy. Widely considered a "strong man," he was recalled to power in January 1934 to deal with disorders provoked by right-wing extremists. Un-deterred, they rioted in Paris on Feb. 6, 1934, and forced Daladier to resign after only 11 days in office. A rival of Herriot and leader of the progressive Radicals, Daladier led his party into Leon Blum's left-wing Popular Front coalition, which won the parliamentary elections of May 1936. He then became minister of national defense. As international tension mounted following Hitler's annexation of Austria, France once more turned to a "strong man," and Daladier resumed the premiership in April 1938. With France the prisoner of British foreign policy, Daladier was forced to support the appeasement policy of Neville Chamberlain. Consequently, he was compelled to acquiesce in the dismembering of Czechoslovakia at Munich in 1938. This act destroyed the security system of France in eastern Europe and encouraged Adolf Hitler in his policy of aggression and violence. Daladier declared war on Germany after Hitler's invasion of Poland in September 1939. He continued in office until March 20, 1940, when he yielded to another "strong man," Paul Reynaud. He remained in the government, however, as minister of war and then as foreign minister until June 16, 1940. Arrested in September by Vichy authorities, he was sent to Riom for trial in 1942. Daladier defended himself with such courage and vigor that the proceedings were suspended. In 1943 he was deported to Germany, where he remained until his liberation in April 1945. After the war Daladier sought to resume his political career but with little success. Although returned to Parliament, he was too much identified with the events which led to the fall of France to regain his prewar position of leadership. Even his tenure as president of the Radical party after the death of Herriot in 1957 was brief and inglorious. After his electoral defeat in the parliamentary elections of November 1958, he retired. 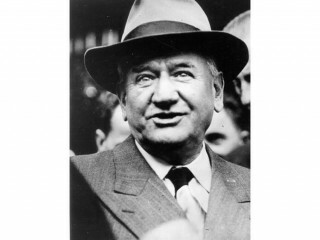 Daladier died in Paris on Oct. 10, 1970. View the full website biography of Edouard Daladier.